On Tuesday 22 March 2011, Ron Pittaway and I visited the ornithology collection at the Royal Ontario Museum where Mark Peck showed us the two latest additions to the collection. 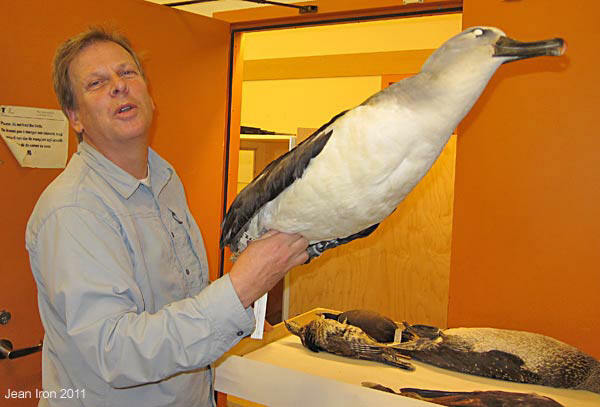 Mark Peck holding the specimen of the Yellow-nosed Albatross, which Paul Martin first spotted in Kingston on 4 July 2010. It was found again on nearby Wolfe Island on 17 July in weakened condition. After being in a rehab centre near Kingston, it was transferred to another facility for possible release. However, the albatross was later euthanized because it was not healthy (fide Ontbirds). Photo 22 March 2011. We think Yellow-nosed Albatross is such a rare bird for Canada, but there are previous records. Godfrey 1986 in The Birds of Canada lists its status in Canada: "Accidental in Quebec (Moisie River, 20 August 1885) and New Brunswick (between Machias Seal Island and Grand Manan, 1 August 1913). Probably also Newfoundland (but specimen and data sheet no longer extant). Sight record for Nova Scotia (64 km off Yarmouth, 20 August 1976)." 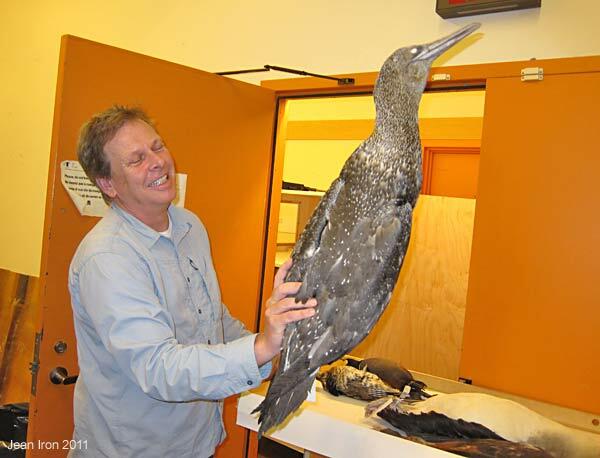 Mark Peck holding a juvenile Northern Gannet that was recovered from Highway 2 near Bowmanville east of Toronto by Tony Wood after it flew into a truck and was later hit by a passing car on 15 November 2010. Reported on Ontbirds by Jim Richards. The misfortune of these huge birds benefits ornithology because these specimens are available for research at the Royal Ontario Museum.